A lot of stuff has happened in the last five years since HBIC started. There have been wars fought, Presidents and Prime Ministers elected and re-elected, births, deaths, weddings, divorces, trades, signings, relocations, and expansions. We've seen a new Royal Couple, a deceased face of terror, five different teams capture a Stanley Cup, multiple fan favorites retire, a new generation of stars emerge, and a piles of stories that have shaped and reshaped our lives. And that's only the tip of the iceberg of what we have witnessed in the last half-decade in life and in hockey. HBIC rolled into its fifth year of existence back on January 21, and it went by without a lot of fanfare mainly because I didn't want to draw a ton of attention to it. 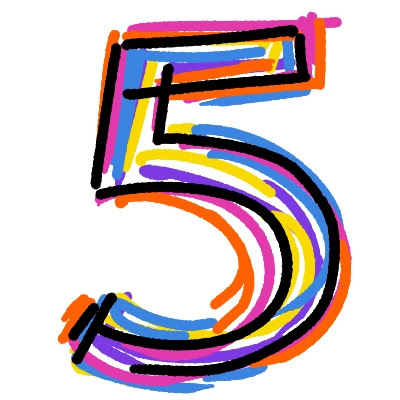 If you've been reading since the calendar turned to 2012, you know I've been talking about awarding prizes all year long in celebration of HBIC fifth anniversary. Today, I am proud to present two prizes to the two men who sent in guest blogger articles: Mr. Peter Santellan and Mr. Mike Engle. The HBIC "Shwag Bag" has a bunch of stuff in it that I have been collecting and waiting to award to HBIC readers, so I'm going to unload to these two men for their efforts in January. I have asked them via email what they would like, and their prizes are being sent out this week. Well done, gentlemen, and keep the articles coming! Five years. Seems like it went by so fast! Thanks for reading, everyone, and here's to the next five-year celebration at the end of HBIC's first decade! The old inbox has been filling up quite quickly, and that means that I have to take a step back and start sorting through the vast amount of email that floods my online mailbox. Don't get me wrong - I like getting email from readers and people who have announcements, so keep them coming. Don't forget that HBIC will be giving away prizes for the best guest bloggers every month this year in honour of this blog's fifth anniversary, so get those articles in, especially if you want a chance at January's prizes! But back to the task at hand, and there are a pile of emails that I want to clean up today. So sit back, have a read, and leave a comment on any of these emails I'm posting here. Enjoy! Miss Angela Holzer, Web & Social Media Coordinator for Ovarian Cancer Canada sent me the following email about an opportunity to win a pretty sweet prize as well as helping Canadian women defeat ovarian cancer. My name is Angela Holzer, I work for Ovarian Cancer Canada and was wondering if you could help us promote a hockey auction item (an autographed team jersey from the 2010 Olympic gold medal winning men's hockey team) that we will be auctioning off at our upcoming LOVE HER event February 23 in Toronto. The jersey comes with a letter of authenticity and we will open the bids to people event if they cannot attend the event. LOVE HER is an event in support of Ovarian Cancer Canada to honour and celebrate women and is dedicated to raising awareness about ovarian cancer - the most fatal women's cancer. This exclusive cocktail reception will be held on February 23, 2012 at the Royal York Hotel in Toronto and feature a fashion show by Canadian fashion label JUDITH & CHARLES and the latest footwear by STUART WEITZMAN. Now being that I'm not based in Toronto, I won't be attending. But, as Angela writes, you can bid even if you cannot attend and possibly take home a Canadian jersey with the names of every member of Team Canada on it! The best part about this, though, is that you can help to save lives. Ovarian cancer affects more than 2600 Canadian women annually. It is the most fatal cancer that affects only women, and each year 1750 women lose their lives to this disease. These women are mothers, sisters, wives, daughters, grandmothers, aunts, and people loved by many. In short, your donation can truly help to save many lives. Please give if you can. Thanks for alerting me of this event, Angela, and here's hoping you raise more money than ever expected! Miss Chantal Herman, a Ph.D. student in Psychology at Carleton University in Ottawa, sent me a quick message asking for help with a study she is doing. While she can probably find any number of places to conduct this study, she turned to me because she needs men to contribute to her research. Here's Chantal's message. For my Ph.D. research I would like to ask men from the community to complete an online survey about non-aggressive and aggressive sexual behaviour. Participants’ responses will be anonymous and their participation will be confidential. I was wondering if it would be possible to post a recruitment advertisement somewhere on your website or Facebook page? We are conducting a survey asking for your opinions and experiences regarding sexual behaviour. Participants will receive a $5.00 gift card for Amazon.com for participating and will be entered into a draw to win a $250.00 gift card for Amazon.com. The survey will ask you to complete several questionnaires about non-aggressive and aggressive sexual behaviour and will take about 45 minutes to complete. All of your answers will be anonymous, meaning no one will know how you responded to our questions. Here is the link to our Lab's website at Carleton University if you would like more information about who we are and the type of research we conduct. Now, you're probably questioning why I agreed to post this. After all, it has nothing do with hockey, so it probably shouldn't have made the cut, right? Well, I figured that the free gift card is a good way for you to get something for answering a few questions. Free stuff is awesome, and I want you to get something for helping someone out. Go ahead and click the link, do the survey, and come back to HBIC for some more email fun. Oh, and earn yourself some free Amazon.com money! Thanks for writing, Chantal! I received an email from Chris C. who, like me, is a big fan of the WHA. Chris had an interesting proposal which I'll answer below. Here is Chris' email. I was just reading your web site about the WHA. Very interesting. Like you I'm a big time hockey fan. I grew up in the Orr hey day here in Mass although I've been a Hugh Habs fan since the mid 70's. I used to read The Hockey News cover to cover and an incident from the 1976 Avco Cup playoffs has me doing research. The Rick Jodzio/Marc Tardif incident. I'm really surprised a book has never been written about it and all the stuff that lead up to it and all the legal issues that followed. I've watched the brawl that followed the hit on Tardif on YouTube many times. Quite the brawl. What are your thoughts on the incident and do you think there is enough there to write a book? First off, if you're not aware of the incident, let's just say that there are enough opinions on what happened that night online than one could ever want to read. Each story differs slightly from the rest, but the YouTube video, while incomplete, shows you a lot about how the Jodzio-Tardif incident played out on that fateful night. My answer, Chris, is that I believe there could be enough of a story here to warrant a book. From what I've read, Rick Jodzio had a long-running feud with Marc Tardif all season long, and the culmination of that feud was the brawl that took place on April 11, 1976. The key to this book, I believe, would be getting all of the players who had a part in this brawl to comment on what they saw, and then to begin weeding through the common bonds between stories. If you really wanted to, Chris, I'd say you'd have the makings of a very good book on this topic if everyone agreed to cooperate. Thanks for writing, Chris, and great question! I received a quick email from Doug B. Doug may not be a man of many words, but he succinctly hit the target that I assume he was intending to hit with this email. Thanks, Doug. I'll keep writing if you keep reading. Thanks for the support! Honestly, Peter, that sickens me as well. Now, I'm not going to paint all San Jose fans with the same brush, but that kind of treatment of anyone is downright disgusting. Whoever those fans were that committed this act of stupidity should not only be ashamed of their actions, but should really take a long look in the mirror in terms of who they are. Idiots. As for this happening in Canada, I'm sure there are examples of it happening, but I've never seen it personally at any sporting event I have attended whether I'm in Canada or in the US. I'm thankful that it doesn't happen all that often, and there's still an element of respect you have to show other fans, even those cheering the opposition. We're all in this together, folks. Let's make being a fan an enjoyable experience for all. And thanks for writing, Peter! If you're not too busy today, make sure you turn the dial over to Sportsnet where the AHL All-Star Game from Atlantic City is being played tonight. The AHL is the breeding ground for the next wave of superstars, so check out these All-Stars doing their thing in the junior circuit. Should be a beauty! A great weekend of hockey and fan interaction came to an end today as the NHL All-Star Game wound down the 2012 NHL All-Star Weekend. Team Alfredsson and Team Chara did battle in the Skills Competition yesterday, and those two fantasy teams met up in the big game today. Could Team Alfredsson send the fans home happy as his Senators-laden team earned the win? Would Team Chara overcome their "deficiencies" in the Skills Competition and defeat Team Alfredsson on Ottawa ice? 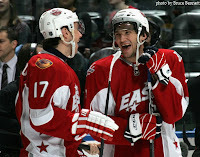 Who would be the MVP in the 2012 NHL All-Star Game? We'll start with the results of the Skills Competition first. The first event held on Saturday evening was the Fastest Skater event. Personally, I miss when all the players would race around the rink trying to beat each other and the clock. This whole skating backwards for the defencemen and having the goalies race? It's not really what I'm there to see. In any case, the fastest player from Team Chara was Ottawa Senator rookie Colin Greening who did the circuit in 12.963 seconds. Team Alfredsson's fastest man was Rangers' rookie Carl Hagelin as he tore around the ice in 12.993 seconds. Those two skated head-to-head in the final, and Hagelin barely edged Greening out, winning in 13.218 seconds to Greening's 13.303 time. Hagelin's winning time is officially the fastest time seen in an NHL Skills Competition, beating Mike Gartner's old record of 13.386 seconds set in 1996. The Breakaway Challenge was next, and fans were able to vote on the player whose moves they liked best. Three-time reigning champion Alexander Ovechkin wasn't at the event, so that means we would have a new champion of the NHL's version of the Slam Dunk Competition. Team Alfredsson's three shooters were Sean Couturier, John Tavares, and Logan Couture. Team Chara countered with Ryan Johansen, Patrick Kane, and Corey Perry. Tema Alfredsson's shooters didn't really resonate with the fans as none of them hit double-digits in fan voting. Personally, they didn't really wow me either. The man who put on a real show was Chicago's Patrick Kane as he donned the Clark Kent glasses and Superman cape during his breakaway chances. The fans in Ottawa warmed up to the show, and gave him the victory with 49% of the votes. Accuracy Shooting was up next, and I always like this event because it really shows who has a knack for putting the puck where they want it. A lot of the greatest goal scorers have never won this event, but the guys who have are always feared shooters in their own rights. Past winners include Daniel Sedin, Evgeni Malkin, Jeremy Roenick, and, the man who has won this event the most in its history, Raymond Bourque. Team Chara would be represented by Cody Hodgson, Tyler Seguin, Jamie Benn, and Marian Hossa. Team Alfredsson would send out Matt Read, Jason Spezza, Steven Stamkos, and reigning champion Daniel Sedin. If this was simply a hit-the-net contest, Steven Stamkos would be a favorite. But it took Stamkos 44.684 seconds to hit all four targets. Yowza! Anyway, Team Chara's most accurate shooter in the shortest time was Dallas' Jamie Benn as he took down the four targets in 13.583 seconds. Philly's Matt Read was Team Alfredsson's most accurate shooter as he nailed all four targets in 14.011 seconds. In the final, Benn made short work of Read as he took down all four targets in 10.204 second while Read needed 16.361 seconds. The Skills Relay Challenge is a collection of passing and shooting drills done in two heats by eight players at a time. This event doesn't really interest me that much because the vast majority of these players will never set one another up in a real game. Needless to say, I happen to flip channels at this time, but Team Alfredsson won in 2:08. The Hardest Shot event was next, and this, to me, is the equivalent of the Home Run Derby in baseball. The Hardest Shot event has been won the last four years by Zdeno Chara, and there's always hope someone can come along and best Boston's big man. Shea Weber always seems to come close, so there was hope that some rockets would fired on Saturday. Team Alfredsson saw three of the four shooters break 100 mph, and Shea Weber emerged as Team Alfredsson's biggest bomber as he reached 104.9 mph on the radar gun. But the big bad Bruin topped all challengers in the preliminaries with a record-breaking 108.8 mph blast! Weber and Chara would square off in the final, and Weber put up his fastest blast of the event in reaching 106.0 mph. But Chara was not to be denied his fifth-straight title as he launched a 107.0 mph blast to best Weber, and give Team Chara the win in this event. The final event was the Elimination Shootout that sees twelve shooters and all goalies involved. Players have to score on their shootout attempt to advance to the next round, and goalies face four players before switching up. Past winners have included Dion Phaneuf, Shane Doan, and Corey Perry. Team Chara's shooters were done early as Brian Elliott, Henrik Lundqvist, and Jonathan Quick turned away all but three shooters in their opening round before Lundqvist closed the door on Malkin, Iginla, and Timonen to end Team Chara's bid for victory in this event. Team Alfredsson saw a number of players advance through to the second round before Jason Pominville, Steven Stamkos, and John Tavares ended up in the third round after having scored on their first two attempts. Stamkos beat Tim Thomas while Thomas stopped Tavares, eliminating Tavares. Jimmy Howard stared down Jason Pominville, and that would give Steven Stamkos and Team Alfredsson the win as he made good on all three attempts. Overall, Team Alfredsson defeated Team Chara by a 21-12 score in the Skills Competition, but the All-Star Game itself hasn't been very friendly to the team that wins the Skills Competition. Would Sunday's game keep the good times rolling for Team Alfredsson, or could Team Chara capture the most important win of the weekend? For a while in the game, it appeared that hometown hero Daniel Alfredsson would capture the MVP award, joining only eight other players in NHL history to win the All-Star Game MVP award on home ice. But a Slovakian emerged from the pack, scoring three goals and adding an assist to outscore Alfredsson and capture the MVP award. Team Chara's Marian Gaborik had his hat trick completed by early in the second period, and Team Chara's Tim Thomas recorded his fourth-straight win at an NHL All-Star Game as Team Chara downed Team Alfredsson by a 12-9 score. While the score reflected those players who won, it was clear that everyone involved had a weekend they won't soon forget. "You can't ask for anything better," Chara said after the game. "We want to enjoy ourselves, have fun, and most of all we want to put on a good show." But the star of the weekend had to be Ottawa's unofficial ambassador, Daniel Alfredsson. "From a selfish point it's going to rank really high, where it's just a whole ego weekend, pretty much," Alfredsson said when asked about his personal thoughts on the weekend. "Personally, I feel healthy," he added. "I'm having fun on the ice again. And, to have a weekend like this, it's surreal. You can never dream of anything like this, and you don't really know how to embrace it. I don't think until tonight, after the kids go to bed, you can kind of sit and relax - I'm sure I'll be dead tired, but I'll take it all in and realize that this is something that not everybody gets a chance to experience. I don't know if I deserve it or not, but it's definitely humbling." Congratulations to Team Chara, to Marian Gaborik for his efforts which resulted in a $25,000 donation to a charity of his choice, and to the people of Ottawa for a fantastic weekend. Here's hoping that next year's game in Columbus only sets the bar higher when it comes to the All-Star Weekend experience! With the Skills Competition coming up today, there's a reasonable amount of anticipation and excitement building for the NHL All-Star Game. Can Zdeno Chara smash his own record in the Hardest Shot Competition? Will we see a new speedster blaze around the rink? What kind of crazy moves and zany outfits will make an appearance in the Breakaway Challenge? All of these questions will be answered in a few hours, but there was bigger news today as the 2013 NHL All-Star Game location was announced by Commissioner Gary Bettman. For the people of Ohio, break out the red carpet and the tuxedos because your Columbus Blue Jackets will host the 2013 NHL All-Star Game! Without a doubt, this has been a trying year for the Blue Jackets franchise. There was much hope in the off-season with the additions of Jeff Carter and James Wisniewski that the Jackets could make a run at another playoff spot, but injuries and bad luck have plagued this team since the opening of training camp. The fans have grown weary of the team's lack of postseason appearances, and I don't blame them for their reluctance in supporting the team after claims of future success have gone unfulfilled. That being said, the NHL had to help the struggling franchise in some way. They are near the ceiling of the salary cap, the fanbase is apathetic at this point, and they will almost certainly post a loss this season. While the NHL isn't truly in the business of propping up struggling franchises, they certainly can't afford another Phoenix debacle. The NHL All-Star Game in Ottawa will see an estimated $30 million in economic impact for the city, and this kind of cash will certainly help the Columbus Blue Jackets. The city itself is located within a reasonable number of bigger centers - Pittsburgh, Toronto, Detroit, Buffalo, and Cleveland - and that will certainly help drive the economic impact as there may be a vast number of visitors invading the city to catch the All-Star Game. Of course, it would be nice for the Jackets to have Rick Nash and maybe another star there, so here's hoping the 2012-13 season works out better than this one has. If they don't, however, the NHL will brings its biggest stars to the Ohio city for a weekend of fun and excitement. For those teams on weaker financial footing, handing them an All-Star Game could turn their fortunes around in the short-term. If they use that cash windfall wisely, they could turn their investments into something that keeps the fans coming back, and to create a way to encourage players to consider their franchise when free agency is upon them. Congratulations to the Columbus Blue Jackets and the city of Columbus, Ohio on being awarded the 2013 NHL All-Star Game! Let's just hope that Ovechkin doesn't decide to skip this one. Matt Hendrick's helmet seemed to be altered last week, and it occurred to me that he had some added protection added to his bucket. 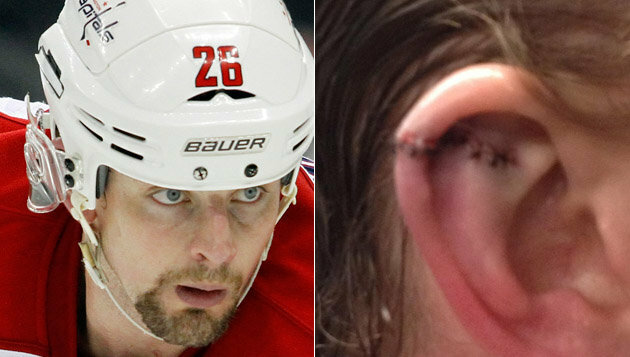 I didn't actually see the injury until I went back to YouTube, but an Alexander Ovechkin shot ricocheted off the glass and literally split Hendricks' ear in two. Thankfully, Mike Engle is back with us today on HBIC with his thoughts on this ear-splitting situation. Mike has penned a second article in January, and this gives him an additional shot at being HBIC's Blogger of the Month! Before we discuss that, though, let's get to Mike's article. Here it is in full, and I'll have some comments after you read through Mike's thoughts. Enjoy! "Last Saturday, Washington Capitals forward Matt Bradley suffered an improbable injury during practice. Greg Wyshynski, of Yahoo! Sports' Puck Daddy, published this article the following Wednesday, complete with an eyewitness narrative, pictures, and a video. Access the multimedia at your own risk, but the completely-safe-for-work blog entry can be found in the link above. "As most tough and proud hockey players would likely do, Bradley shook off the injury and saw action the day after against the Penguins. Appropriately, he sported a modified helmet with an ear guard mounted on the outside of his helmet. Amidst all of the hullabaloo about safer helmets, mandatory-or-not visors, and soft-capped equipment, ear guards are rarely talked about as being 'missing' from today's NHL. However, in light of Hendricks' recent mishap, it amazes me that ear guards have not been rendered mandatory. "Established in 1978, as per the request of USA Hockey, the Hockey Equipment Certification Council (HECC) was created to, as the name would suggest, certify hockey equipment. With very few exceptions, all hockey helmets sold at retail are HECC certified. However, HECC certification for helmets are based on the condition that the ear guards remain installed! Meanwhile, a quick perusal of the NHL rulebook - namely Section 3, pertaining to equipment - yields no mention of HECC guidelines. One can only imagine how much man-time is lost to equipment managers unscrewing those screws, removing the ear guards, and replacing those screws just to make the players look a little less geeky! "On a related note, if the geeky look works for Malkin and Crosby, it can't be that bad, can it? "Granted, it is highly unlikely that the NHL would adopt a policy to lighten equipment managers' workloads. And even if it were the case, the ever-so-humble equipment managers would undoubtedly deflect the benefits to somebody else, or simply choose to place the focus on their roles in helping the players. Instead, what other motivations, whether for or against mandatory ear guards, exist? Against mandatory ear guards: The players should be allowed some degree of choice. Rebuttal: There's already plenty of choice. As long as the NHL jersey is made by Reebok and has a fight strap, there are few universal constants. Equipment brand? White or yellow laces? Mouthpiece? As long as helmets are mandated, I don't think two little pieces of plastic are going to cause widespread discomfort. Against: It's such an isolated incident, why be so alarmed? Jamie McLennan's ruptured testicle, Bryan Berard's eye injury, Taylor Hall's recent skate to the face after a tumble during warm-ups, and Clint Malarchuk's slit throat were all isolated incidents as well. Better to take the time to uninstall two little pieces of plastic, instead of taking a HECC certified helmet out of the box, adjusting, adding decals, and being ready to go? I think not. For the adoption of mandatory ear guards: The NHL should promote a clear and unambiguous front on head safety. ESPN.com's Tuesday Morning Quarterback columnist Gregg Easterbrook would be livid at the NHL, while undoubtedly swearing by football's example. 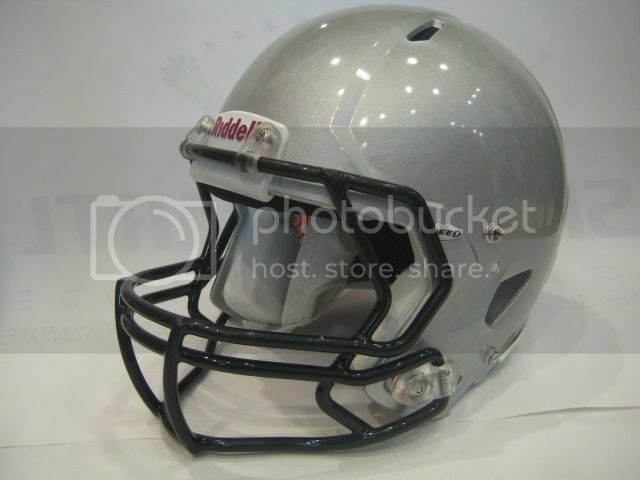 The Riddell Revolution football helmet, while aesthetically avant-garde, is acknowledged as a relatively advanced anti-concussion helmet, and is widely worn by NFL stars such as Peyton Manning. As a result, Revolutions have gradually become mandatory at various high schools and universities, including Boston College. On the other hand, would the NHL be aware of its message, that young players should have to wear 'safer' helmets than the pros? "For now, I rest my case. Even though it probably isn't the most pressing issue on the NHL player safety agenda, the ear guard question is an underrated point that rarely receives airtime in hockey circles. Though ear guards probably should be mandated, and relatively easily, I'm not predicting that this action will pass any time soon. I will gladly table the ear guard issue, on the condition that the NHL keep furthering its anti-concussion agenda. In the mean time, I eagerly await your comments in the comment section - especially if you can provide better reasons why ear guards should NOT be mandated." There you have it, folks: a challenge laid out for the comment section. But Mike makes a good point: why remove the ear guards from helmets that specifically come with them attached? Why decrease the safety of a device built to provide the best safety possible for your melon and its appendages? Having your bell rung is one thing, but if you've ever cut your ear, you know it bleeds like crazy and it hurts like nothing else. The ear actually contains a vast amount of nerve endings, and, if you've ever had an ear get frostbitten, you know how much it burns when it begins to warm up. That's because all those nerves that were freezing are beginning to warm up. And it hurts! So I ask you, readers, like Mike has asked: do you have any plausible reason to remove the ear guards off a helmet? Especially after seeing what happened to Mike Hendricks's ear? Let me know in the comments as well! And if you want to get your thoughts out to the world about the game of hockey, please email me with an article! Your article will put you in the running for the Blogger of the Month contest being held all year long! The best part? If you are picked, you're in the running for some keen prizes! So get writing, and get yourself some free gear! There are a number of NHL players who will receive a sweater today once they have been drafted in the NHL All-Star Fantasy Draft, but HBIC is here with a story that all kids should read or have read to them at some point in their childhoods. Teebz's Book Club has been negligent in not covering this book sooner, but here we are today, correcting an error that needs correcting. Teebz's Book Club is proud to present The Hockey Sweater, written by Roch Carrier, illustrated by Sheldon Cohen, translated by Sheila Fischman, and published by Tundra Books. The Hockey Sweater is perhaps the most well-known hockey story across the land, and the message contained in its words is an excellent lesson for kids everywhere. From the Tundra Books website, "Roch Carrier is Canada’s National Librarian and the beloved author of many Canadian classics for both adults and children. In 1968 he published his hugely successful novel, La Guerre, Yes Sir!. He has written many novels, short stories, plays, film and television scripts, essays, travel books, and poetry. Several of his works have become classics and are used in schools and universities around the world. His much-loved children's story, The Hockey Sweater, remains a timeless favorite. In 1991, Roch Carrier was awarded the Stephen Leacock Award for Humour for Prayers of a Very Wise Child. 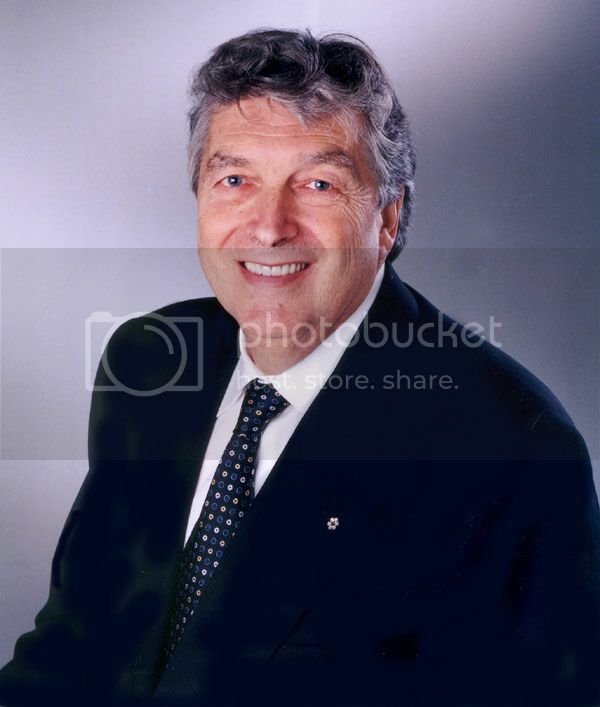 Among his many other awards and honors, Mr. Carrier is a Fellow of the Royal Society of Canada, an Officer of the Order of Canada, and the holder of many honorary doctorates. All this from the boy who grew up in a village with no library and no books. Now the village has a brand new library – the Roch Carrier Library." 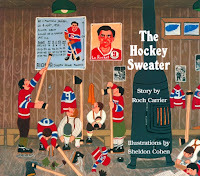 Honestly, the story of The Hockey Sweater is a fantastic look at a young boy's obsession with the Montreal Canadiens and, in particular, Maurice Richard. The story takes place in a first-person perspective as our Habs-loving youngster embarks on another winter in 1946 with his red, white, and blue jersey with the number 9 on the back. Of course, with any growing boy, the Montreal Canadiens sweater that he had worn for so long began to grow smaller and started showing its wear as holes and frays began to appear. And like any boy his age, our protagonist's mother began flipping through the Timothy Eaton's catalogue in order to get her boy a new sweater. One letter to Timothy Eaton himself, and two weeks later, a package arrived for our Canadiens fan! If you've read the story yourself, you know what happens next. I'm not going to reveal the rest of the story or the conclusion here, but the story takes a major turn at this point. It is in this turn that we learn about how deep the passion runs when it comes to following your favorite team. The illustrations by Mr. Cohen are slightly rudimentary, but very detailed in what they show. The thing I liked best is that all the illustrations are still in their original French, keeping the integrity of the drawings intact. 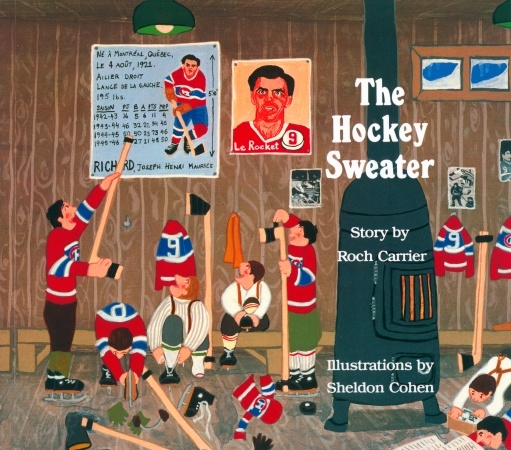 Mr. Cohen's illustrations are an excellent way to have a visual explanation of the story to go along with Mr. Carrier's story of The Hockey Sweater. The Hockey Sweater is a great read for younger readers. It's only 24 pages long, making it a great option for readers that are just starting their hockey adventures, and the words used in translation by Miss Fischman may provide an opportunity for learning new, longer words! The Hockey Sweater absolutely is a must-have for any hockey literature collection, and it definitely deserves the Teebz's Book Club Seal of Approval for standing the test of time in two languages! Take in this photo as best as you can, hockey fans, because only one of these two players has been invited to appear in Ottawa this weekend. If you guessed correctly, Washington star Alexander Ovechkin was invited, but instead has decided to skip the All-Star festivities this weekend. While it's not difficult to accept that a suspended player shouldn't be taking part in an NHL-sanctioned game, it's hard to stomach that one of the most recognizable players has decided to skip a game that really is meant for the fans and corporate sponsors. Y'know... those people who keep the blank ink flowing at the NHL offices and its teams' offices. Now some may criticize me for taking Ovechkin to task when stars such as Nicklas Lidstrom and Teemu Selanne get the weekend off with praise from the NHL. I suppose that's a fair assessment except for the fact that both of those players are on the edge of the All-Star Game inclusion this season. While Lidstrom and Selanne are certainly big names, and have been for some time, the inclusion of these two are more or less irrelevant for this discussion. But I will touch on these two below. Alexander Ovechkin is one of the most marketable stars in the NHL today. His jersey sales consistently have him in the top-ten of sales, he has several deals hawking various products, and his face is flashed across a number of NHL marketing campaigns. In short, he is one of the men responsible for the success of the NHL in terms of fan and corporate sponsor dollars. The All-Star Game, in its most empirical form, is nothing but a cash-cow for the NHL as they milk the fans and sponsors for all they can. The Fan Fair is setup for fans to attend where they can test their own skills and meet and greet current and former NHL stars. The Skills Competition, while entertaining, is its own ticket for entrance and provides a pile of concession and parking revenues for the host team. And then there's the All-Star Game itself where fans pile in, buy souvenirs, and generally exhaust their wallets, debit cards, and credit cards in an effort to obtain the latest and greatest merchandise. And the corporate sponsors? They get the free meals and tickets in exchange for them to push NHL wares and merchandise. In pushing all this merchandise and whatever onto fans and sponsors, the NHL needs marketable stars present at the game. This year's game has seen Daniel Alfredsson become the official ambassador for the NHL in Ottawa, and I'm fairly certain that the NHL has been overjoyed with the work that the Senators organization has done in promoting this game thus far. But selling tickets to an All-Star Game is a lot easier when the stars show up to play. And it's not just the All-Star Game that I'm referring to when I say that missing stars hurts. Arguably, the NHL Skills Competition suffers when the best players at their positions don't play. Alexander Ovechkin? He's creative, he's flashy, he likes the attention that comes with his imagination in the various talent competition, and the NHL Skills Competition needs him as much as the NHL needs a guy like Sidney Crosby healthy. In essence, the integrity of the game suffers when big-name players don't play on the biggest stages. Remember these flashy moves from 2009? You don't think that the fans love that kind of enthusiasm and fun shown by a player that loves to play the game? Maybe you remember these moves from last year's game? Ovechkin's skill set simply is unparalleled in the NHL, and that's coming from a guy who has been a lifelong Penguins fan. The fact that we won't see Ovechkin pulling off moves like those seen above this year is, to me, a shame, even if his "heart is not there". "My heart is not there. I got suspended so why do I have to go there," Ovechkin told reporters Tuesday at the team's practice facility. "I love the game, it's a great event. I'd love to be there but I'm suspended. If I'm suspended, I have to be suspended." If he's trying to set an example for other suspended players, good for him, but it doesn't reflect well on him from a fan's perspective. The NHL has stated that Ovechkin would be welcome at the NHL All-Star Game, but would not insist that he would be there. Again, that's fair from the NHL's perspective, but I'm not buying the "my heart is not there" babble and the suspension rhetoric. If anything, Ovechkin, in this writer's view, is sticking to the NHL for suspending him for three games for his check to Michalek's head. That's fine for him to do when it comes to sticking it to his employer, but this event is largely for the fans and corporate sponsors. This event makes the NHL decent coin, and this allows the NHL salary cap to go up because the cap is tied to NHL revenues. This allows the Capitals to pay Ovechkin the money agreed upon in his contract, and that money is made from ticket sales, merchandise sales, and corporate sponsorship. 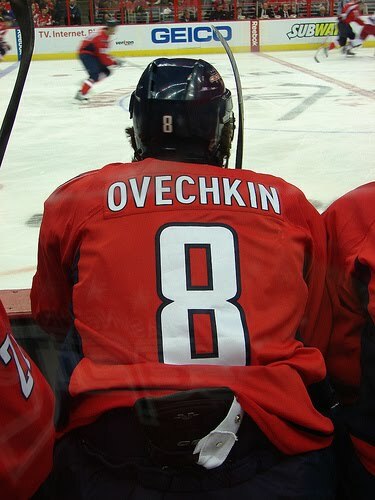 Personally, I believe Ovechkin should be playing this weekend. I appreciate the fact that he took himself out of the game if he isn't going to give 100%, but when names like Crosby, Toews, Pronger, Nugent-Hopkins, and Skinner aren't able to play due to injury and others such as Lecavalier, Staal, and Duchene don't make the cut, having Alexander Ovechkin there becomes that much more important. As for Lidstrom and Selanne, I'd like to believe that they should be there, but I'm in the same thought as some of the media. If a player hits the age of 40 and is still playing at a high level so that they earn a spot in the NHL All-Star Game, but opts out of it, I, and others, believe they have earned that right after putting in two decades worth of hockey at the highest level. I do not support the 35-and-over idea being lobbed around the media circles, but I believe that any player age 40 or older has certainly earned the right to opt out of the game after putting in all their years on the ice. 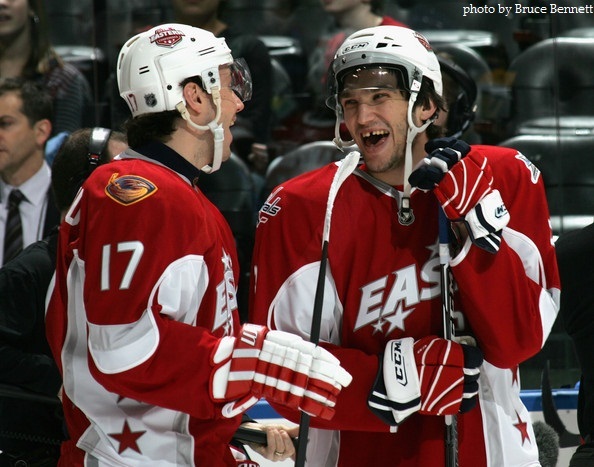 Especially these two classy gentlemen who have attended 21 NHL All-Star Games combined. As for Ovechkin, he should be there. I know some people will say that a suspended player should lose all rights and privileges to play while being suspended, but his star power is something that the fans and sponsors are paying to see. There had to have been some concern in Mudville, aka Washington DC, when the mighty Ovechkin was given a three-game suspension for leaving his feet and checking Zbynek Michalek's head into the boards a couple of nights ago. After all, the vast majority of Washington's offence seems to filter through Ovechkin, and with Backstrom on the shelf and Semin doing his best Harry Houdini disappearance trick, there was every reason to believe that Washington's next three games could set them back. Tonight's game against the Bruins could have been considered a lost cause with the way the Bruins have been playing, but the Capitals should really consider looking to Hershey when the chips are down and they need a shake-up. Mathieu Perreault was a star with the Hershey Bears last season, and earned himself a few call-ups to Washington that resulted in him seeing action in 35 NHL games. He had 11 goals and 24 assists in 34 games with the Bears, and then used his limited action in the NHL to put up seven goals and seven assists in the 35 games he got in the NHL. His efforts last season and in training camp this season earned him a roster spot with the Capitals, and he showed why the Capitals have faith in him on Tuesday night. Mathieu Perreault scored his first NHL hat trick in helping the Capitals beat the Bruins by a 5-3 score. Perreault scored two in the second period, including one on a breakaway, and the third tally in the third period. Perreault's accomplishment shows that while he can play a more defensive role as a thrid- or fourth-liner, he certainly deserves an opportunity to step into a scoring role when given the opportunity. While Perreault was a star with Hershey for the Bears, there are a number of other players that the Capitals could call on in times of need. Keith Aucoin is having himself an outstanding season thus far, amassing 11 goals and 59 assists in 43 games. Winger Chris Bourque has 21 goals and 43 assists in 43 games, while Jacob Micflikier has 19 goals and 29 assists in 44 games. The Capitals have one of the deepest farm teams in recent memory, yet they rarely call up these fantastic offensive players. Granted, some of the players on the Bears would need to clear waivers in order to play with Washington, and that would be a detriment to the AHL club if the Bears were to lose a great player on the waiver wire. But the Capitals are spending money on players down their roster that they really don't have to pay when they could simply sign some of their highly-talented minor-league talent to play up. There could be opportunities in the future, though. Mike Knuble will turn 40 on July 4 while Jeff Halpern will be 36 on May 3. If the Capitals need these two players replaced, they may need to only make one phone call. And that call could bring in two players with a high offensive ability that the Capitals simply aren't getting out of their grizzled veterans right now that they can desperately use. All in all, Perreault had himself a whale of a game, and he looked like he did in Hershey for the last few seasons. Great jump from the former Acadie-Bathurst Titan in notching his first hat trick of the season! Here's hoping the Capitals lean on their farmhands a little more if they find themselves in need of some scoring! The KHL All-Star Game went on Saturday, and the game featured a lot of offence, no hitting, and some very bloated goals-against averages. In short, it was like any other hockey all-star game. Team Fedorov and Team Ozolinsh squared off in Riga, Latvia in front of a capacity crowd, and the show began. Honestly, the talent in the KHL is high despite there being few players that North Americans will recognize. The KHL All-Star Game is proof of this. The All-Star Game also featured a tribute to those players lost in the Lokomotiv tragedy earlier this season. The video is entirely in Russian, but the message and memory of the Lokomotiv players and coaches is clear in this video. An excellent tribute from the KHL and the fans in Riga. The best move of the night? Salavat Yulaev Ufa's Alexander Radulov - the former Nashville Predator sniper - got a chance to skate in on a penalty shot, and his move, while subtle, shows hands of gold. That slight backhand that found space under Konstantin Barulin and between his pads is a thing of beauty! Radulov might be one of the best players not playing in the NHL right now, and this penalty shot shows why he's an all-star. The final score in the KHL All-Star Game was 15-11 in favour of Team Fedorov representing the Eastern Conference. SOGAZ Insurance Group sponsored the Most Reliable Defenseman award for each team. Dmitry Kalinin (Team Ozolins) and Ilya Nikulin (Team Fedorov) were the winners, and they receive a certificate of an insurance policy for foreign travel, providing cover worth up to €300,000. MegaFon sponsored "The Future Depends on You" award for the two youngest all-stars on each team. 21 year-old defenseman Maxim Chudinov and 23 year-old forward Mikhail Anisin were Team Ozoliņš's youngest players while Team Fedorov was represented by 19 year-old Evgeny Kuznetsov and 20 year-old Vladimir Tarasenko. All four men received a tablet computer and a year of unlimited Internet access, plus a handy sports bag. Personally, I'm not sure what the Internet is like in Russia in terms of costs, so this could be a big-ticket item. Baltic Miles sponsored the MVP awards for the KHL All-Star Game for each team's best player. Not surprisingly, the two most recognizable names were the MVPs! Sandis Ozolins and Sergei Fedorov took home the honours, and each received a week’s holiday for them and their families in a five-star hotel, with a rented car at their disposal and a choice of Turkey, Greece or Egypt as their destination. The 2013 KHL All-Star Game will move to Chelyabinsk next season, so plan accordingly if you have a chance to attend! Hoepfully there will be English coverage broadcast back to North America again as I really enjoyed seeing some of the Russian players I grew up with performing in front of friends and family in their homeland. Well done, KHL, on a solid weekend of fun for fans and players! Six straight wins, and the Pittsburgh Penguins are back in the race for the Eastern Conference title. Of course, they still have some ground to make up on the Bruins and Rangers, but this team, riddled with injuries, looks scary as the offence is clicking on all cylinders. While you would expect Evgeni Malkin to be a part of that offensive outburst, the fact that Malkin is looking like the second coming of #66 shows that he can not only lead this Penguins team through adversity, but that he is arguably the best player in the NHL right now. Today's game against the Washington Capitals was a little weird as the two teams have struggled thus far. The Capitals can't seem to get on the same page as their stars appear to be going through the motions most nights while the Penguins have dealt with injuries to a vast number of their stars - Crosby, Staal, Letang, and Neal. But with the Capitals seeing some life in Ovechkin and the Penguins getting their offensive dynamo in Malkin going, this game turned out to be a great Sunday afternoon game. "I have great confidence now, you know?" Malkin told the Associated Press. "You win six games, I think everyone has great confidence now. I just am enjoying the game, you know? And having fun." Malkin not only leads the league in scoring, but his six games with goals is the longest streak in the NHL thus far this season. His goal 1:31 into overtime gave Pittsburgh the 4-3 win over Washington, and his two assists pushed him to 58 points on the season. But it's just how Malkin has taken over games lately that is showing why he is a world-class talent. His natural hat trick in the game against the Tampa Bay Lightning, including his scrum with Vincent Lecavalier, showed that he can impose his will on a game and mix in a little nastiness as well. His goal on Monday against the Canadiens tied the game, and Malkin showed a little dazzle in the shootout with his winner. In short, Malkin has returned to the form that allowed him to capture the Conn Smythe Trophyin 2009. Of course, having your star players performing at their best will turn any team's fortunes to the positive, but Malkin, it seems, is literally willing his team to win. The game against the Lightning looked lost until Malkin imposed himself on the game. Take a look at the jump that Malkin has in Tampa Bay. 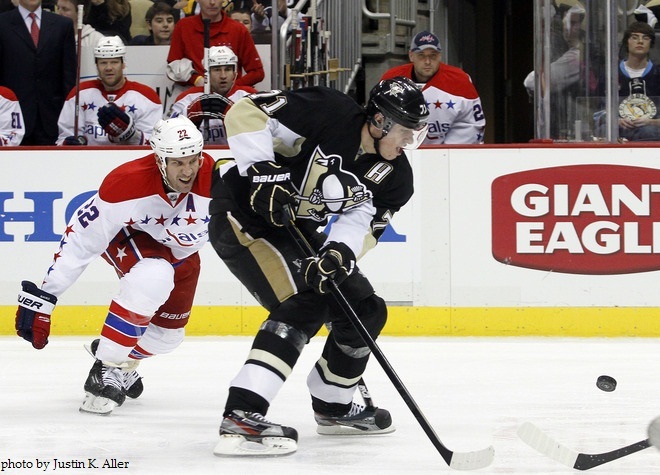 Malkin just looks like he wants the puck, and, when he gets it, he seems to find the net or someone who can convert. While I'm not going to say that he has Super Mario's vision, Malkin is showing that he can be a force with his size and skill, and that bodes well for the second half of the season. It's clear that as Malkin goes, so do the Penguins. James Neal and Chris Kunitz are benefiting from Malkin's immense skill, and it's clear that Malkin is on a different level than most of the NHL at this point in the season. While there will be peaks and valleys still to come in Malkin's career, there's no doubt that the Hart Trophy discussion at this point in this season has to involve Evgeni Malkin. Hamilton's Ivor Wynne Stadium was home to a pretty good game today. Not a CFL football game, mind you, but an AHL game between the hometown Hamilton Bulldogs and the visiting Toronto Marlies. The game was, in my opinion, a great display of AHL hockey as the two teams battled in a North Division contest, and the fans in Hamilton turned out in a big way to watch the AHL's Battle of Ontario write another chapter in its history. While the end result wasn't exactly an edge-of-your-seat outcome, the action on the ice should give hope to fans of both the Montreal Canadiens and the Toronto Maple Leafs. The temperature at game time was a balmy -4C (25F), and both teams enjoyed the warmer winter weather while playing a solid game. It looked like this game might be dominated by the fourth-place Bulldogs when Dany Masse scored just 27 seconds into the game. But the first-place Marlies roared back, controlling the game from that point on. The 7-2 Marlies win was more of a blowout than anything, but the largest crowd to ever watch an AHL game in Canada - 20,565 fans - went home happy after a great game. If you happened to catch the game or viewed the picture linked above, you may have noticed that the Hamilton Bulldogs looked a little different than they normally do. Hamilton wore these uniforms for the game, and they looked pretty good. I can't really find fault with anything on these jerseys, but the use of the cream colour for "vintage" jerseys is starting to wear thin. White in the sunlight looks pretty darn good, and I wish that teams would start using white again when given the option for a special jersey. In any case, here are the highlights in six minutes of the game at Ivor Wynne today. The AHL Outdoor Classic is a great AHL event, and I really hope they'll continue to use these games to build momentum for the AHL. Having watched the Manitoba Moose for a long time, I am a true fan of the AHL and I really think that this league deserves more credit for the stars they are developing. Here are the highlights! That Joe Colborne goal that made it 5-2? That's a big reason why the Leafs should be excited about him. That was a big-league goal scored by one of the better defencemen in the AHL this season. That setup by Matt Frattin was pretty good as well - perhaps a sign that his time spent with the Leafs has already made him a better player. 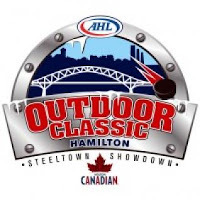 Congratulations to the people of Hamilton on hosting a fabulous event, and for setting the record that all future games will look to eclipse when it comes to attendance! 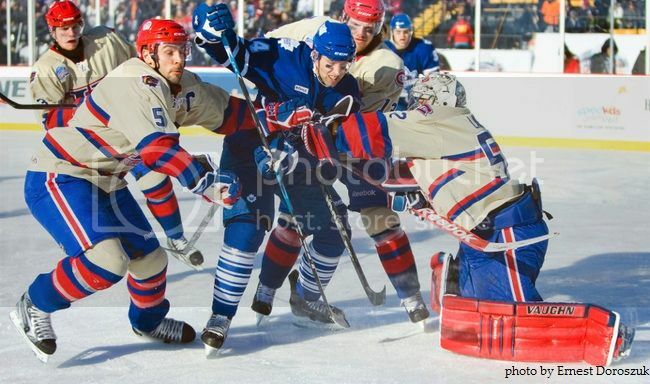 I really enjoyed the game on television, and I can only hope to get to an Outdoor Classic one day in the future! I'll admit something about myself that you may not know. When I'm getting ready for work in the morning, I usually watch SportsCenter on TSN. However, certain highlight packages don't interest me, so I begin to channel surf. The one program that always stops me is OLN's ManTracker. I'm not sure if it's the thrill of watching a trained 25-year-veteran of the Alberta Foothills Search and Rescue Team hunt down people who believe that they can elude the ManTracker, but Terry Grant's knowledge of the outdoors and how to track people mesmerizes me. 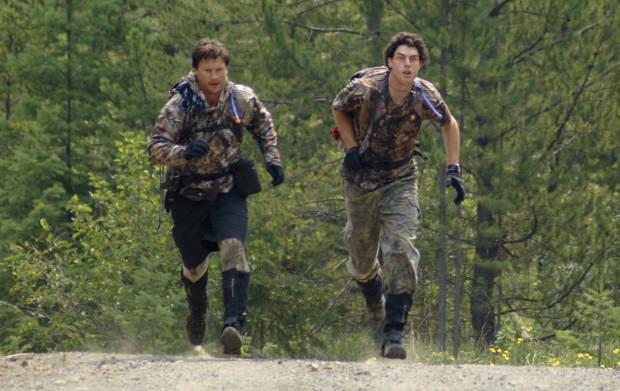 Season Six of ManTracker featured Phoenix Coyotes' star Shane Doan as the prey. Shane Doan was partnered with his 23-year-old brother Brook, an electrician from Halkirk, Alberta, in British Columbia's southern Chilcotin Mountains as they attempted to avoid Terry "ManTracker" Grant and his partner, local hunting guide Russ Floyd, across 37 kilometers of mountain terrain. Personally, I'm pretty sure I'd get caught in about 10 minutes by ManTracker, so I was very interested in seeing how Shane and Brook did in this episode. Thanks to YouTube, you can watch the entire episode to see if the Doans can avoid being caught! Just as a heads-up, this video is nearly 60 minutes long, so be prepared with a beverage if you want to watch from start to finish. Pretty darn good episode, if I do say so myself! The Doans put on a pretty good show in evading ManTracker, and they'll have this achievement to talk about for a long, long time! "It will be something I never ever forget," Shane told the camera. "For the rest of our lives, we'll have that and that's special." "It was my Stanley Cup," Brook said to the camera. This episode originally aired on OLN on April 17, 2011, but I had yet to see it. I'm glad that I did, though, because it really shows how good of an athlete Shane Doan is. While it may have taken him 1161 games to notch his first hat trick, the tricks used by the Doans to avoid ManTracker gave them the all-important win in BC! With the KHL All-Star Game fast approaching on January 21, there have been some announcements made regarding who will be taking part in the game and what activities will go on in the days leading up to the game. The starters for the game were picked long ago, so it was just a matter of filling additional spots on the two teams - Team Ozolinsh and Team Fedorov - to complete the All-Star Game rosters. It also sounds as if the All-Star Game will feature many of the same things the NHL All-Star Game does: a skills competition and a legends game. I'm particularly intrigued by the KHL Legends Game simply because I want to see who fills out that roster, but we'll start with today's KHL All-Stars and which team they will be representing. Team Ozolins will represent the Western Conference of the KHL, and it seems that the vast majority of this team played in the NHL at one point or another. Here is Team Ozolins in its entirety. Forwards: Mikelis Redlihs, Vadim Shipachyov, Jeff Platt, Sergei Shirokov, Mikhail Anisin, Toni Martensson, Nikolai Zherdev, Martins Karsums, Vyacheslav Kozlov. That's a pretty recognizable lineup for Sandis Ozolinsh's team, but Sergei Fedorov's squad, representing the Eastern Conference, also has some pretty impressive names playing. While the number of former NHLers isn't as great, Team Fedorov does have some high-scoring players. Forwards: Sergei Fedorov (captain), Evgeny Kuznetsov, Alexei Kalyuzhny, Jakub Petruzalek, Alexander Radulov, Vladimir Tarasenko, Roman Cervenka, Sergei Mozyakin, Brandon Bochenski, Alexander Frolov. On paper, I would have to believe that Ozolinsh's team has more firepower based on name recognition alone, but I'm going with Team Fedorov on this one because of the high-scoring players selected. Of course, that's why they play the game, and you can catch the KHL All-Star Game this weekend on TSN2! The KHL Legends Game will play Friday evening on January 20. Vyacheslav Fetisov and Helmuts Balderis will captain the two teams, and there are some very notable names taking part in this game. The oldest player is Latvian Anatolijs Jemeljanenko, born Janaury 1, 1949, who starred for Dinamo Riga in the 1970s. He's one day older than Vladimir Lutchenko, born January 2, 1949, who played for the USSR in the 1972 Summit Series while wearing #3. He starred with HC CSKA Moscow in the Russian SuperLeague. The youngest player will be Artis Abols, born January 3, 1973, who played for a number of Russian, Latvian, and Scandinavian teams during his career, including a few appears for the Latvian national team. The rosters for the two teams are posted below, and I'll try to give a brief description of each player so you have a better idea who each of these legends are. #30 Sergejs Naumovs - played all over the world and on Team Latvia. #1 Guntis Karklins - Latvian who starred with Dinamo Riga. #5 Aleksandrs Siskovics - Latvian who played all over Europe. #28 Andrejs Maticins - Russian who starred with Dinamo Riga. #33 Agris Balodis - Latvian who starred with Latvijas Zelts Riga. #44 Normunds Sejejs - Latvian and current GM with Dinamo Riga. #22 Vadims Solovjovs - Latvian who starred with HK NIK's Brih Riga. #3 Viktors Ignatjevs - Spent 11 games with the Penguins in '98-99. #2 Konstantins Grigorjevs - Latvian who starred with Dinamo Riga. #8 Martins Grundmanis - Latvian who starred with Saga Kekava. #19 Hemluts Balderis - Two-time leading scorer in Russia. #7 Anatolijs Jemeljanenko - Latvian who starred with Dinamo Riga. #13 Nikolajs Sirotkins - Latvian who starred with HK NIK's Brih Riga. #21 Aleksandrs Kercs - 57 games with the '93 Cape Breton Oilers. #25 Sergejs Nikitins - Latvian who starred with HK NIK's Brih Riga. #18 Sergejs Povecerovskis - Latvian who played on Lido Nafta Riga. #24 Andrejs Ignatovics - best forward in the B-World Championships. #26 Artis Abols - Played with Latvia in four World Championships. #11 Olegs Znaroks - Latvian who starred with DEL's EHC Freiburg. #10 Juris Opulskis - Latvian who starred in the German Elite League. #29 Aigars Cipruss - First goal for the new Team Latvia in '92. #20 Harijs Vitolins - Played 8 games with the '93-94 Winnipeg Jets. #23 Maris Drelings - Latvian who starred with HK NIK's Brih Riga. #20 Maxim Mikhailovsky - Russian who starred with CSKA Moscow. #1 Vladimir Myshkin - Losing goaltender in the "Miracle On Ice". #2 Vyacheslav Fetisov - Legendary Russian defenceman. #7 Alexei Kasatonov - Stanley Cup winner in '94 with the Rangers. #3 Vladimir Lutchenko - Defenceman in the 1972 Summit Series. #15 Evgeny Shtepa - Russian who starred with Krylja Sovetov. #6 Dmitry Frolov - Russian who starred with Dynamo Moscow. #10 Vladimir Tyurikov - Russian who starred with Spartak Moscow. #23 Vladimir Malakhov - Stanley Cup winner in 2000 with the Devils. #5 Alexei Gusarov - Stanley Cup winner in 1996 with the Avalanche. #55 Sergey Gimaev - Russian who starred with Severstal Cherepovets. #8 Alexander Golikov - Russian who starred with Dynamo Moscow. #25 Vladimir Golikov - Russian who starred with Dynamo Moscow. #11 Alexander Medvedev - President of the KHL. #24 Sergei Makarov - Legendary member of the KLM line. #16 Alexander Kozhevnikov - Russian who played on Spartak Moscow. #13 Valery Kamensky - Stanley Cup winner in '96 on the Avalanche. #28 Lev Berdichevsky - 38 games with the Adirondack Red Wings. #71 Igor Varitsky - Russian who starred with Chelyabinsk Traktor. #64 Evgeny Chizhmin - Russian who starred in the German League. #9 Viktor Shalimov - Scoring leader in 1976 with Spartak Moscow. #17 Vitaly Prokhorov - 83 games with the St. Louis Blues. #51 Andrei Kovalenko - 620 NHL games with six NHL teams. #22 Vyacheslav Anisin - Scoring leader in 1974 with Krylia Sovetov. #26 Vyacheslav Butsaev - 132 NHL games with six teams. It seems as though this game will be Team Latvia versus Team Russia in terms of how the teams are put together. In any case, I expect all of these legendary players to have smiles as wide as the rink as they "compete" once again for bragging rights. As you can see, the Russians would most likely have the edge if the game was all about name recognition, but they're playing the game for a reason. I'll try and update everyone as to what happens on Saturday, but I'm going to be ridiculously busy all weekend with other happenings. Updates will happen where possible, but you can catch the KHL All-Star Game on TSN2! Check your local listings! I'm off to hockey right away, but Taylor Hall suffered what can only be called a scary injury tonight during the pre-game skate before the Oilers squared off against the Blue Jackets. Take a look at this. Corey Potter steps on Taylor Hall's head as he tried to avoid both Hall and Ladislav Smid sliding into the corner. No updates yet as I get ready for hockey except that Hall is off the ice and not on the bench. Let me just say that I will be wearing my bucket on my head when I take to the ice for the pre-game skate. That's a scary-looking injury, especially when you consider that Hall's eye and/or cheek could have been cut by Potter's skate. Kids, they tell you to wear helmets for your protection. Don't be like Taylor Hall. WEAR YOUR BUCKET WHEN YOU'RE ON THE ICE! I'm off. Here's hoping that Hall's injury isn't too gruesome. I wouldn't say I'm the biggest Radiohead fan, but the song Karma Police has a certain catchy sound that I can't shake out of my head when I hear it. And it's been running through my head all day today after reading that Daniel Carcillo's season is over as he underwent knee surgery to repair the anterior cruciate ligament in his left knee. I'm not hear to celebrate his injury or even revel in the fact that he has been shelved for the next six months, but I think that sometimes karma comes back to bite someone in the rear end in a big way. Remember this hit from two weeks ago? You can see that Carcillo injures himself on the play after he recklessly hammers Tom Gilbert into the boards. Carcillo didn't return to the game, but it wouldn't have mattered as he was assessed a boarding major and a game misconduct for his heinous check. 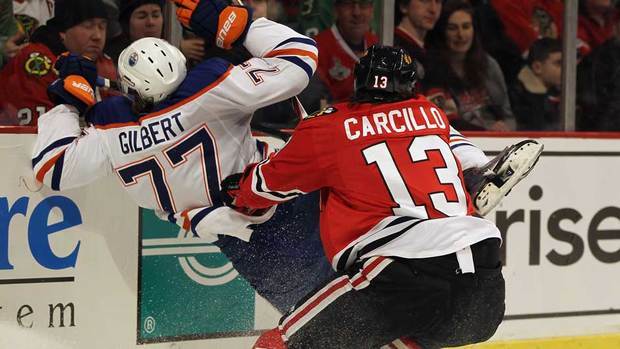 Game, set, match for Carcillo. A couple of days later, Brendan Shanahan had his say on the hit, and he wasn't impressed either. "Not only does Carcillo not minimize contact, he hits Gilbert into the boards with tremendous force," Shanahan said in a video posted on NHL.com. "This is not a case of two players bumping each other for position and one player winning that battle. Nor is it a play in which Gilbert loses balance after initiating a reverse hit. "At an extremely dangerous distance from the boards, Carcillo finishes high and hard with his hands, using the boards as a weapon." Shanahan's decision would have sat Daniel Carcillo for another seven games as he is a repeat offender. So while Tom Gilbert suffered with a knee injury that could possibly keep him out for up to a month after Carcillo's hit, Carcillo would have sat for another couple of weeks due to his poor choice. But karma decided that Carcillo needed a little wake-up call on January 2, 2012. Having committed a number of indiscretions on the ice, the karma police decided to give Daniel Carcillo six months off, a pile of rehab, and a load of pain to deal with as he snapped his ACL on the Gilbert hit. And suddenly, one of the bad guys in the NHL gets what's coming to him. As Radiohead sang, "This is what you get. This is what you get. This is what you get when you mess with us." And he got a whole cart full of just desserts. Eat it up, Daniel, because you got what was coming in a big way. And with that, we'll see you next season if rehab goes well. And then maybe you'll think twice before recklessly trying to destroy another player's career. Heck, you might even decide to prolong your career the next time you take a dangerous run at someone! There are a few teams who have already replaced their head coach in an effort to produce results on the ice. One such team is the Columbus Blue Jackets as head coach Scott Arniel was given his pink slip about a week ago. With the Blue Jackets still struggling on the ice, the crosshairs move further up the ladder as GM Scott Howson finds himself on the hot seat now. And if we are to believe a report that surfaced today, the Blue Jackets are apparently considering former Leafs GM John Ferguson Jr. as his replacement. I have to wonder if the Blue Jackets are actually trying to improve their team if this report holds true. John Ferguson Jr. is a very good hockey executive, but his track record as an NHL general manager is questionable. Then again, the man that reported this turn of events, Bruce Garrioch, also has a questionable track record. But let's take this report at face value and break down what we know. When Brian Burke took over as GM in Toronto from the Ferguson era, the Leafs were a mess, having not made the playoffs since the lockout. His deals to acquire Andrew Raycroft from Boston and Vesa Toskala from San Jose gave up a ton of potential as Tuukka Rask and a handful of high draft picks left the organization. His record of no-trade clauses combined with albatross salaries made moving players like Bryan McCabe, Pavel Kubina, and Darcy Tucker almost impossible. Needless to say, the Leafs needed some vast rebuilding after Ferguson had cleaned out his desk. While the Blue Jackets have some valuable pieces on their roster currently, there isn't a lot of wiggle room in terms of cap space to go out and restock the cupboards. There are some decent prospects playing for the AHL's Springfield Falcons as Cody Goloubef, Cam Atkinson, and Martin St. Pierre are having decent seasons, but, like the Blue Jackets, the Falcons are near the bottom of the AHL standings. Personally, I think that even giving John Ferguson Jr. a chance to run a team that needs considerable rebuilding is a mistake. The Blue Jackets should look at someone who has had success in the position before in terms of shrewd drafting. Former Penguins GM Craig Patrick was just hired by Columbus as the Senior Advisor of Hockey Operations, and has a pretty solid track record when it comes to success at the NHL level. Pat Quinn could easily step into the GM role and bring some accountability and respect to a franchise that has made the playoffs only once in its existence. Other possibilities include Rick Dudley, Bob Gainey, and Pierre Lacroix - three men who have had success building and running Stanley Cup-winning teams. Personally, I'm not against John Ferguson Jr. in any way. I simply don't like his management style, and I don't think he's the right man for the rebuild that is currently underway in Columbus. He's a solid NHL executive, but he didn't handle the scrutiny in Toronto well and the fans in Columbus have lost all patience with their club. Putting Ferguson back into the fire probably won't end well for anyone. Rumours should remain rumours. Bruce Garrioch shouldn't even break this "report" unless he has absolute confirmation that the Blue Jackets have, indeed, spoken to the San Jose Sharks about the availability of John Ferguson Jr. If you ask me, however, I don't think Columbus is remotely interested. Of course, I have been wrong before. And I'm sure it will happen again. I have to admit that a lot of the books on Teebz's Book Club are fairly tame. There's not a lot of controversy because the subject is usually about something or someone that is in the public eye. 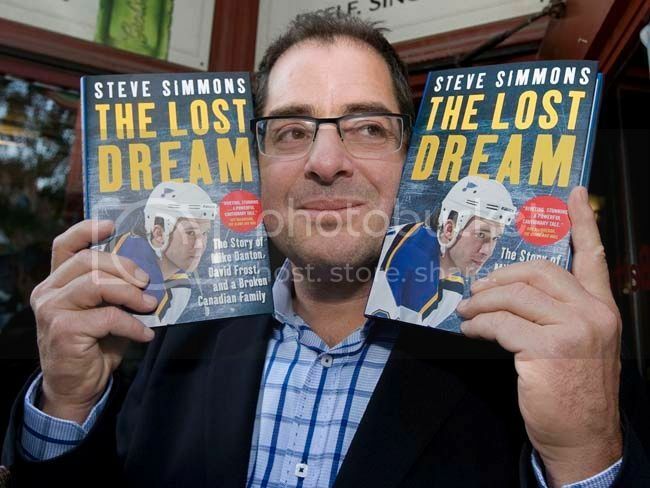 Today, however, Teebz's Book Club will be reviewing one of the most controversial books ever written about the sport as we look at The Lost Dream, written by Steve Simmons and published by the Penguin Group. The strange part is that this book is about Mike Danton, David Frost, and the murder-for-hire plot that Danton hatched, but neither Frost nor Danton contributed anything to the book. Instead, we get the other side of the story from the Jeffersons, Mike's biological family, and a number of players and people from the hockey world. The end result leaves you feeling a little rattled, but Mr. Simmons does an excellent job at laying out all the facts that are given from the perspective of everyone that had the fortune, or misfortune, of crossing paths with Frost and Danton. From the Penguin website, "Steve Simmons is one of Canada’s best known and most provocative sports columnists. His column appears regularly in the Toronto Sun and other Sun Media and QMI publications. His signature Sunday notes column has been called 'the most read page in Canadian journalism.' Author of the bestselling Lanny and contributor to eight other books, Simmons appears regularly on TSN The Reporters with Dave Hodge and That's Hockey 2Nite on TSN2. A minor-hockey enthusiast and longtime coach, Simmons lives outside Toronto with his wife, Sheila, and sons, Jeffrey and Michael." I have read, listened to, and watched Steve Simmons my entire life, it seems, and I occasionally find his material to be far too self-serving and subjective for my liking. There is no doubt that Mr. Simmons is an excellent journalist, however, and this book is solid proof that Mr. Simmons knows how to research, interview, and compile facts without changing the story. Honestly, the material covered by Mr. Simmons could have been littered with his own personal spin on the story, but the work done in getting The Lost Dream published is a great achievement. 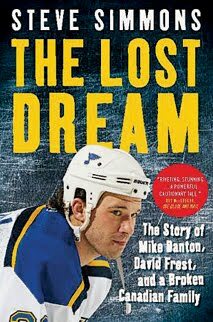 If you're not aware, St. Louis Blues forward Mike Danton tried to hire someone to kill David Frost. The only problem is that Danton reportedly wanted his father, Steve Jefferson, dead despite giving the hitman his address where Frost was staying and Frost's picture. Danton denies that Frost was the target, but it's clear through the research and evidence presented by Mr. Simmons in The Lost Dream that there is a lot more to this story than what Danton and Frost are alleging. First, let me post this timeline of the events surrounding this bizarre happening. While Mike Danton has apparently escaped the grips of David Frost's insanity, the timeline paints a very scary picture of a man who can only be described as a "predator". I won't lie about this: I found The Lost Dream difficult to read at times because of the material presented. The stories told through the Jeffersons and others reveals the vast amount of manipulation and fabrication of the truth that David Frost used to change how several young, impressionable men viewed their own families. The portion about Tom Jefferson at David Frost's cottage is perhaps some of the most disturbing writing I have ever encountered in a book about hockey, but it's scarier to think that Tom Jefferson has lived through the trauma to tell his side of the story about his experiences with David Frost. In saying this, though, Mr. Simmons has done incredible work despite a number of the key individuals in the saga that refused to comment. Mike Danton was not interviewed for the book, and he refused any comment regarding the topic. Mr. Simmons declined to interview David Frost because of the vast amount of lies he has told throughout his life. Hockey names such as Vancouver GM Mike Gillis - a former agent of Danton's - and NHL referee Wes McCauley - brother of David Frost's wife, Bridget - both refused to speak to Mr. Simmons about Mike Danton, David Frost, or the circumstances that surrounded the plot to kill Frost. Former NHLPA Executive Director Bob Goodenow also refused to comment, and he was the man that got Frost into NHL circles! "'I don't know if any of us can understand what happened with him and Frost. But unless you've experienced it, even from our end, it's very hard to explain. It's not exaggerated. It was there, very noticeable to our people and our players. The word I would use is bizarre. All my life in hockey, I'd never seen anything like it. The whole experience was just not normal.'" The Lost Dream is definitely for an older crowd in terms of the age demographic that is targeted. While the 255-page book is a good read, it is difficult to digest some of the atrocities that people were put through in their dealings with David Frost. Again, Mike Danton and David Frost were not interviewed for this book, but it is very difficult to deny the allegations and stories that are echoed by many people interviewed by Mr. Simmons. I was very interested in The Lost Dream when I first was browsing at my local bookstore, and I am very glad that I received it as a gift. The work done by Mr. Simmons is top-notch, and he doesn't slant the story one way or another. He simply lets those involved tell their side of the story if they were willing to speak. For that and for his excellent work in bringing this story to print, The Lost Dream absolutely deserves the Teebz's Book Club Seal of Approval for giving the other people involved in this saga a voice. It was definitely heard by this reader. With Rene Bourque getting ready to hit the ice for the Canadiens tonight, I received an email from a native Montreal citizen in Mike Engle. Mike is a loyal Canadiens supporter, a frequent commenter and guest contributor on Uni-Watch, and an all-around good guy. Mike has decided to throw his name into the ring for HBIC's Blogger of the Month with his guest post that is posted below. More on that at the end of this article. I'll allow you to read through Mike's thoughts, and I'll make a few comments below Mike's writing. Personally, the insight from Montreal is pretty important when considering the Cammalleri-Bourque trade from earlier this week. Here's Mike! "A sudden turn of events today marked another cold chapter in a long Montreal winter. Unfortunately, I am not referencing the recent snowstorms that have blanketed the city. Instead, the Montreal Canadiens pulled the trigger on one the most high-profile, and arguably hasty, trades since the 1995 Patrick Roy trade. This time, Michael Cammalleri was the departing former playoff hero. He started packing his bags during the third period of the evening's Habs/Bruins game, having been shipped to the Calgary Flames before the final buzzer. Alongside Cammalleri, Karri Ramo and Montreal's 2012 5th-round draft pick will be moving westward, in exchange for Rene Bourque, Patrick Holland, and Calgary's 2013 2nd-round draft pick. "Unlike most hockey trades, which are almost always strictly business-oriented, the Cammalleri trade appeared to have its fair share of drama and curiosity. Only days ago, Cammalleri either claimed that his Habs teammates were losers, or that they were playing with a losing attitude, depending on which language's news outlets you would prefer to quote. Despite Cammalleri's brief moment of audible frustration, compounded with reduced ice-time under interim anglophone head coach Randy Cunneyworth, it was surprising to see him traded, and perhaps even more surprising in context. "Though Gauthier and Flames GM Jay Feaster both claimed that the trade was in the works for some time, this Habs-supporting columnist must question the timing of the trade. While in-game trades are not unprecedented in baseball, this particular transaction reeked of bad blood. 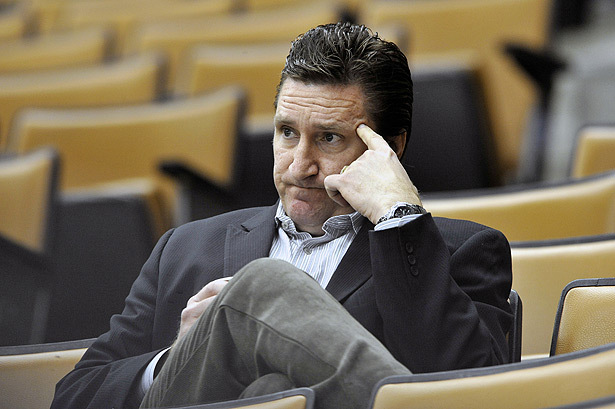 In addition, one must wonder if Gauthier sold short on his expensive sniper, as ESPN hockey columnist and Twitterer Pierre LeBrun noted that one other GM would have made the Habs an offer, if Cammalleri had been publicly available. "So, Teebz' readers, what do you think of the Cammalleri trade? A good move for the reeling Habs, or a bad one? Will Pierre Gauthier live to make another trade for Le Tricolore? And was this in-game trade a jab at the departing #13, or simply awkward timing?" Great article, Michael, and thank you for submitting it. You make a number of good points, and I hadn't even considered the similarities between the trading of two Montreal playoff heroes in Patrick Roy and Mike Cammalleri. While I'd argue that the trading of Patrick Roy rocked the Canadiens to a point that they still have not recovered from, the trading of Mike Cammalleri after his amazing playoff run last season probably won't have the same impact simply because Cammalleri's regular season success has been nowhere near the impact that Roy had during his days in Montreal. But the fact remains: a playoff hero was traded in 1995, and a playoff hero was traded in 2012. So what say you, readers: do you think that this move was a good one for the Canadiens? Personally, I think it is, but my opinion means little in the grand scope of things. And of the timing, did the trade just happen to occur at a time when Cammalleri's comments were still in play, or was the trade the result of his comments? What say you, readers? Thanks again, Mike, and I'll be in contact with you if you're the winner of the Blogger of the Month prize. If you'd like to have a chance at picking up some free prizes while HBIC celebrates its fifth anniversary, scribe an article and send it here. I'll post it, and you'll be eligible for a prize if you're picked as the Blogger of the Month! 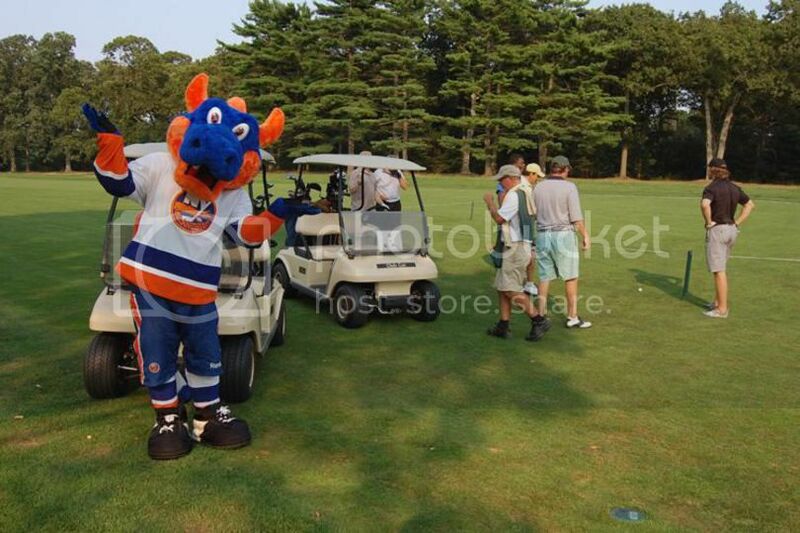 Remember when Garth Snow put all his eggs in one basket and signed Rick DiPietro to that lifetime contract? Remember when everyone was asking why Snow would do something like that when DiPietro had yet to really break into the upper echelon of NHL goaltenders? Doesn't it seem like eons ago that the contract was signed? 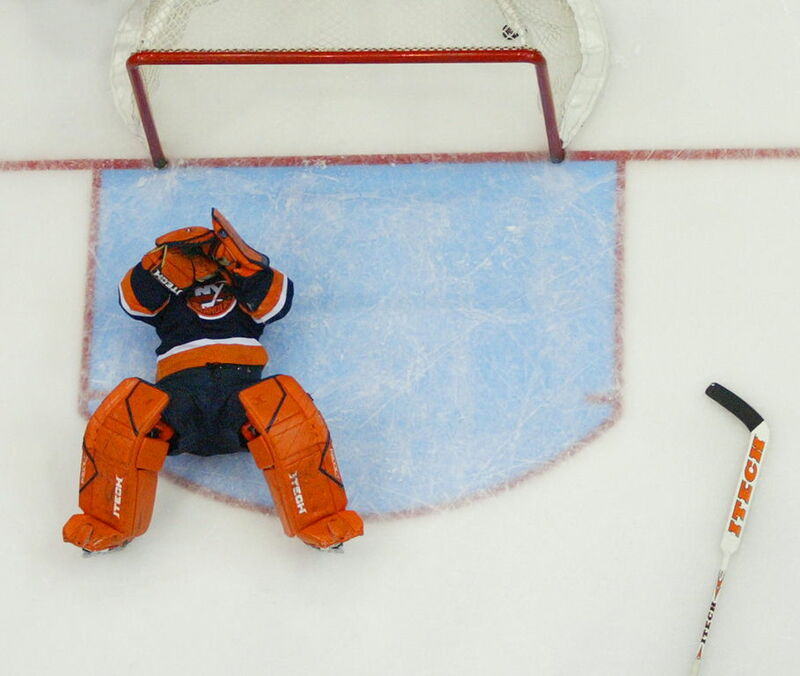 Well, we're looking at another lost season for Rick DiPietro as it was announced that he would be having sports hernia surgery next Tuesday, most likely sidelining him for the rest of this season. If it wasn't for bad luck, DiPietro would have no luck at all. And here I am, writing about DiPietro's bad luck on Friday the 13th! 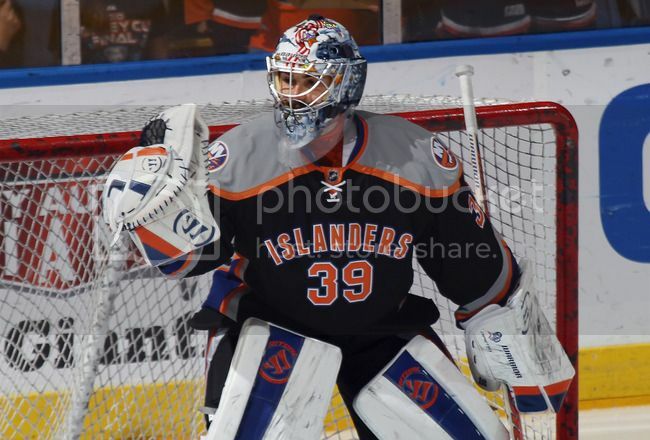 DiPietro was 3-2-3 in eight games this season with the Islanders, sporting a 3.73 GAA. The last time he suited up was for a December 3 game against the Dallas Stars when he suffered a groin injury. Honestly, DiPietro's list of injuries might be longer than the contract he signed in 2006-07. In the last three seasons, DiPietro has played a total of 63 games. Hip, groin, and knee injuries combined with an infamous facial fracture have limited his time over the last three seasons to an average of a quarter of a season. According to Garth Snow, the earliest that DiPietro can return from this surgery will be April, but doctors haven't ruled out his ability to drive a cart at this point. Then again, if I had any bump or bruise to speak of as a member of the Islanders, I might use it to prevent me from wearing horrendous clothing on the ice. Perhaps there's a method to DiPietro's madness after all. I wish DiPietro a speedy recovery from his sports hernia surgery so that he can one day return to the ice full-time. I just hope that the golf outings from April until September won't cause any new injuries to occur. I was just stepping off the ice at hockey when the latest NHL trade was announced. At first, I thought it might be a joke when you consider that the player that Montreal was receiving was serving a suspension, but it turned out to be very true once I found out that the player being sent to Calgary had been pulled off the ice for the Canadiens tonight. And with that, the chatter on the team went from our game to the Mike Cammalleri-Rene Bourque trade. The full trade sees Calgary ship Rene Bourque, Patrick Holland, and a second-round pick in the 2013 draft to Montreal for Mike Cammalleri, Karri Ramo and a fifth-round pick in the 2012 draft. Calgary now holds Ramo's rights as he tends nets in the KHL for Avangard Omsk. Honestly, this trade seems a little one-sided when you first look at this trade, but I think that the Canadiens actually may come out ahead on this one. Seriously. Calgary is apparently making a serious run at a playoff spot, and they needed to find a scoring option to help Jarome Iginla. Bringing in Cammalleri, who posted career highs in goals and points in Calgary, should help both the powerplay and the offence in general. Calgary certainly will get some help if Cammalleri can break out of his slump this season alongside Iginla, and that, in turn, will help the Flames immensely as they push for a playoff spot in the ultra-competitive Western Conference. Karri Ramo is in his third season with Avangard Omsk, and there's no guarantee he'll return to North America. Sure, there's the possibility that he could replace Miikka Kiprusoff, but Ramo is playing pretty good hockey in Russia. It may take a significant deal to bring him over, especially one that offers no possibility of being shipped down to Abbotsford of the AHL. Even that, though, may not bring Ramo over as his success in the KHL has kept him there for the last few seasons. The fifth-round pick in the 2012 NHL Entry Draft is nice, but it's a middle-round pick. Unless there's some significant talent available in this draft, I haven't seen Calgary's scouting team have much success outside of the first few rounds. After all the controversy in Montreal, I think people will view this trade negatively at first because of the statistics, but there's a lot to like about this deal if you're a Habs fan. And yes, I'm very serious. First, the Canadiens bring in a bigger player - something they sorely lack. Besides Erik Cole, the Canadiens don't have anyone else who could even remotely be considered a "power forward". Rene Bourque certainly brings a more physical edge than Cammalleri, and his larger frame can help on the powerplay in front of the net, a place rarely visited by Canadien players. While Bourque's offensive potential isn't nearly as high as Cammalleri's is, the fact that the Canadiens receive a player that is willing to go into the corners and throw his body around is a significant change from the way this team plays. Bourque's physical element, if he plays clean, should open up ice for the rest of the Canadiens, and that will make their jobs a little easier. Offensive potential aside, Bourque should help his teammates get closer to their potentials if he can play in a physical but controlled manner. Throw in the fact that Bourque's contract is way more affordable than Cammalleri's deal, and the Canadiens also get a very important luxury in this deal: about $3 million in cap space. That amount of money can buy the Canadiens a pretty nice rental piece for the playoffs if they can move up the Eastern Conference standings. If not, they have that much available for free agent signings this off-season. Patrick Holland, I think, is a bit of a steal in this deal. Holland is in his third season with the WHL's Tri-City Americans, and he's certainly getting better with each season. He has nearly equaled his 62-point season from last year, and we're only halfway through the WHL season thus far. He was the Americans' Rookie of the Year in 2009-10, and his progress has continued to snowball as he has shown better vision, a fabulous set of hands, and excellent skating as he gets stronger. Holland won't be the next Ovechkin or Crosby, however. What you'll get out of Holland is a solid third-line player who will kill penalties, score when given the opportunity, and give 100% every time he's on the ice. He's the kind of player that every coach loves to have because he'll do his job efficiently, not be a liability on defence, and he'll give you the same consistent effort on every shift. Holland will need some seasoning in the AHL before getting a chance with the Canadiens, but I think that Holland has a very good chance to be the same type of player as a Mike Peca or Todd Marchant. Every team can use a solid two-way player like Holland. Toss in that second-round pick in the 2013 NHL Entry Draft, and the Canadiens come away with possibly two good young players, a physical forward desperately needed in Rene Bourque, and some good cap flexibility. If you ask me, the Canadiens come away from this trade in a great position. The Flames, while getting the potential offence of Cammalleri for the remainder of his contract, give up cap space, give up a high-round draft pick in 2013, give up a solid junior player, and get little in return other than a goaltender in the KHL. I'm not sure this trade really benefits the Flames beyond this season. For everyone who thinks that Cammalleri was traded because of his "loser" comments to the media the other day, both Pierre Gauthier and Jay Feaster shot down those ideas. "No, not at all," Gauthier told the media. "I didn't make a big deal about all that. There's emotion around the team, somebody says something, I'd rather see emotion than people that don't care. He never asked to be traded or anything. He's part of the team and he cares a lot. That's why he made those comments." "When Bourquie was suspended this most recent time, I thought there no sense trying to advance it any further while he was on the suspended list," Feaster said. "Last night, Pierre called and asked if we were still interested and I said we were, and we started working on it again last night and into today and ultimately got it done late this afternoon." 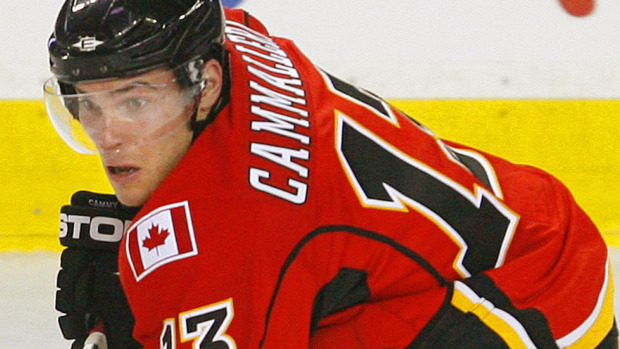 And so it begins again for Cammalleri in Calgary as he joins the Flames for the second time in his career. As for Rene Bourque, he might be able to join head coach Randy Cunneyworth in learning French as he gets a new start in Montreal. It will be interesting to see how these two trades change the dynamics of the respective teams, but I believe the long-term benefits will be experienced by Montreal more than Calgary.